This story belongs in the Forest Tales continuity, but it is set slightly into the future of the current storyline in the year 2334. Shaman had been preoccupied with her herb gathering but, as always, her senses had been alert for danger. Therefore the sudden unexpected wail had startled her so badly, she was halfway up a tree before realising what the actual source of the noise was. She climbed down a lot more slowly and carefully, as befitted a Garetta of her age, trying to size up the strange person who had managed to sneak up on her. "Mercy sakes, child! You’re likely to scare a body half to death!" she said. Now that she was on the ground with… whatever it was, Shaman had to wonder if ‘child’ was the correct term. Although the face, voice and demeanour was that of a child, she was almost as tall as the adult Garetta, and probably more massive. Shaman had decided that it was a she judging by the pigtails and pretty top that she was wearing, but that was all that was familiar about her. 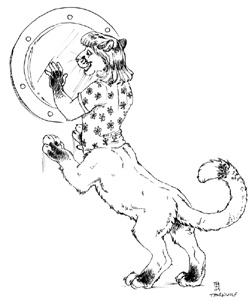 The only thing that she seemed to have in common with the Garetta foxtaurs was that she was a taur too, and as far as Shaman knew, there weren’t any other taur species on Tanador. Her muzzle was shorter and wider, her ears rounder, her body sturdier with powerful legs and paws, and that tail! It was so long, and it seemed to move with a life of its own. The cub sniffled and said, "I can’t find my mommy." Shaman could actually feel the child’s misery and fear, and she reached out instinctively to hug and comfort her, realising as she did that this was why her senses hadn’t alerted her – she wasn’t a threat; just a lost and unhappy cub. "What’s your name, child?" Shaman asked as she cuddled her reassuringly. "Eudora Whitepaw, but Mommy and Daddy just call me Dora mostly." "Then I will call you Dora too." Her answers added to the puzzle though. Aside from a strong accent, they talked the same language, which meant that their kind had to have something in common, and yet Shaman was more certain than ever that nothing like her was known anywhere that the Garetta had colonised. "My name is Shaman, Dora, and I am a Garetta. May I ask what you are?" "I’m a chakat. You look like a foxtaur like Auntie Malena, but you’re really small and a funny colour." Shaman was both amused and edified by Eudora’s words. "We are a kind of foxtaur, and this is our normal size and colouration. It’s you who are very big. Is that normal for you? And is bright red the normal colour of chakats?" Aside from white fur on her chest and belly, fingers and toes, she was almost completely red with a few black markings. "Chakats have lots of colours. Mommy has gold fur – that’s hir name too. Auntie Forest is orange with black spots. Auntie Midnight is all black. "How strange. So where do you come from, Dora?" Eudora’s face fell, and the tears started welling in hir eyes again. "I don’t know! I’m lost!" "Oh dear, that wasn’t what I meant. I suppose I had better take you to the Comm-Sa village for now until we can find out where you belong." Shaman held out her hand. The Star Corps had long ago figured out that they got better and more productive work from mated couples or triads who all worked for the Corps, therefore it was a long-standing policy to provide facilities for entire families on the exploration ships. That way they could keep all their workers together for the sometimes very lengthy tours of duty. Even the shuttles that brought the major equipment down to the base camp had a room set aside as a temporary crèche for the children while their parents set up the huts and the force-field perimeter, and could then safely bring their children outside. The six year old Eudora had done this kind of thing many times before as hir mother and sire worked… and shi was bored of it. Shi occasionally glimpsed hir parents through the view-port. They were putting up those glowing poles that Mom said would keep them safe. Other people were putting up huts or moving stuff around while some people stood around with big guns, just watching. Shi wanted to be out there helping too! Just then something alighted on the view-port’s rim, practically under Eudora’s nose. It was a large insect-like creature, which would have been fascinating enough except that its wings also refracted the light in dazzling bursts of colour. "Ooh!" Eudora was delighted, and shi watched it in fascination for about a minute before it flew off, only to alight again on a bush to one side. The cub craned hir neck to try to keep looking at it, only to have it flitter away further. Eudora mewed in frustration, then decided that shi had to go outside to have a closer look at it. Shi looked around to see Aleta, the rabbit morph left watching the cubs, reading a story to some of them while hir sister, Tailstalker, and another child were making it hard to hear because of their noisy game. Eudora smiled. Shi was a clever cub – too clever hir parents sometimes said after shi kept getting into trouble. Shi knew that shi could sneak away. Shi had watched the grown-ups push the keys that would unlock the door, and knew which ones would open it for hir. All shi had to do was make sure that shi wasn’t spotted. Aleta was distracted though, and Eudora sidled up to the door. When shi was sure that Aleta wasn’t looking, shi quickly pushed the keys. The door quietly and efficiently slid open, completely inaudible over the ruckus. Eudora quickly stepped through and the door closed again without anyone noticing hir exit from the room. 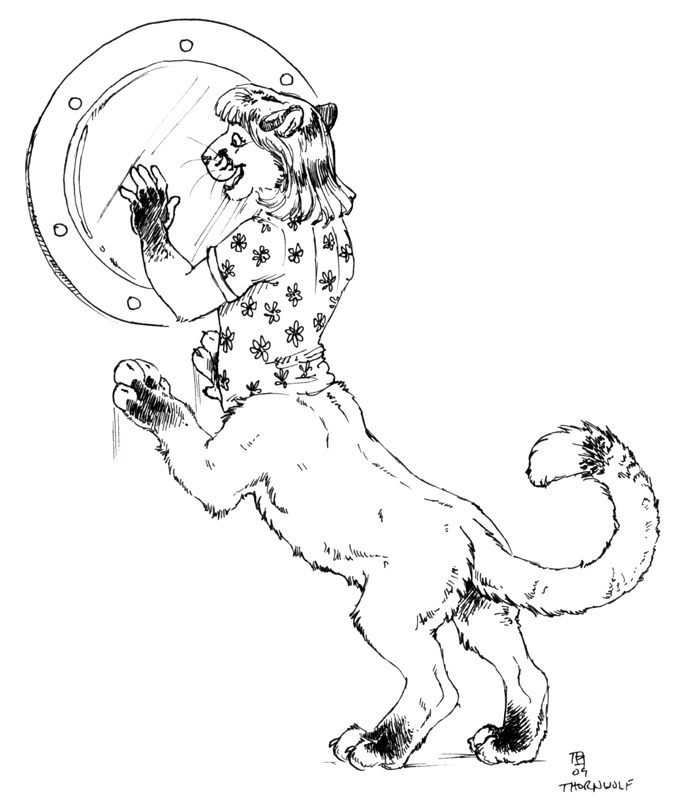 The cub was excited by hir escape, and shi quickly found hir way out of the shuttle. Shi avoided the adults in case they made hir go back to the crèche, which wasn’t too hard as they were all intently busy, and shi went in search of hir pretty bugs. It wasn’t particularly hard as it turned out that there were quite a lot of them. Shi laughed in delight, and shi followed them from bush to rock to flower to another bush. Without even noticing it, shi was quickly putting distance between the base camp and hirself. Twenty four minutes later when the force-field fence was completed and switched on, Eudora was over a kilometre away and enjoying hirself immensely. Back at the shuttle, parents came and collected their children by ones and twos. Some would be moving into the huts that were the base of operations. Others took their children for a short sightseeing trip around the base before beaming back up to the mother ship. Aleta never noticed that one of her charges had not left with hir parents. Goldfur and Garrek moved onto another job after setting up the force-field barrier, secure in the knowledge that their cubs were safely cared for while they were busy. Goldfur also knew that shi could sense empathically from that distance if anything went really wrong. Thus it was much later when the couple went to fetch their cubs and were horrified to find one missing. A frantic search failed to find the errant child. Aleta had been reduced to tears after Goldfur had started screaming at her for losing hir cub, and Garrek had to get hir to restrain hir temper. He deflected hir away from the poor rabbit morph by reminding hir how Forestwalker and Midnight had tracked Ketta years ago. To do that though, Goldfur had to calm down completely in order to focus hir senses. Shi began to panic again though when shi couldn’t detect more than some faint traces outside the shuttle. Unknown to hir, not only was Eudora much further away than Ketta had been when they tried that stunt, but the force-field was partially blocking hir senses and the empathic link, and every moment the distance between mother and child was gradually increasing. This was no longer fun. Eudora had jammed a forepaw between rocks, and a beetle had bitten hir, and shi was beginning to feel thirsty and hungry. It was time to go back. Eudora turned around and started retracing hir steps, but quickly grew confused. Shi spotted what shi thought was a familiar rocky outcrop and went in that direction, only to find hirself in totally unknown territory. Shi tried to recall what hir Auntie Forestwalker had told hir about bushwalking, and shi remembered something about using the sun as a guide, so shi tried that. Unfortunately, heading towards the sun took hir off at a large angle to the correct route, and shi was actually still moving away from the shuttle. Then Eudora started getting afraid. Hir mother had always found hir when shi got really upset, and the cub hoped that shi would do so now, even if shi yelled at hir for leaving the crèche and wandering away from the shuttle. Sadly for the frightened child, hir mother was unable to sense hir anymore. Shi wasn’t even wearing the locator bracelet that shi was always supposed to have on when shi went outside. After what seemed to be ages, shi heard someone humming a song in the distance. With a burst of relief, Eudora thought that shi had finally found the base camp. Shi hurried towards the sound, but when a gap between the trees revealed no camp but just a funny little foxtaur vixen, hir hopes were dashed. Shi walked up to the vixen, naturally light and quiet on hir paws, and wailed, "I’m lost!" The vixen had jumped almost straight up into the tree, leaving the upset cub even more confused and unhappy. The sun had just started dipping below the horizon when Shaman and Eudora arrived at the Comm-Sa village. The cub garnered many astounded looks, but Shaman didn’t stop to let them indulge their curiosity. She made a beeline for the hut of Alisbeth, a den-mother with several cubs, who excelled at looking after children. Delicious smells of cooking wafted from the window of the hut, and Shaman reckoned her timing was perfect. "Ho! Alisbeth!" Shaman called from the doorway of the hut. "Shaman! Come on in! It’s good to see you again," Alisbeth called back. Shaman entered with Eudora in tow, and Alisbeth’s eyes widened in surprise. "Who is this?" she asked, then added, "What is this?" "This is Dora, and she is lost. As for what – she says she’s a chakat, whatever that is, and only a small child despite her size." Alisbeth looked at the cub critically, then held out her hands. "Come here, Dora. Let’s have a good look at you." Eudora could sense nothing but good intentions from the vixen, so shi went over. Alisbeth gently ruffled hir hair and stroked a cheek ruff. Then she lifted hir chin to gaze into hir eyes. "Well, I’ve never seen anyone quite like you before, but I can tell a hungry child when I see one. Would you like to join us for dinner, Dora?" Alisbeth smiled. "I thought you would. Shaman, would you like to join us?" "The chieftain isn’t expecting me until tomorrow, so I’d be delighted, thanks." Shaman fished inside her waist pouch and pulled out some herbs. "While I was looking for calm-root for Debra’s birthing, I found some nigi leaves for your cooking." "Oh, thanks! I was completely out. Now if you’d like to call in the kits, I’ll start serving up the food." Shaman left to do so, and Alisbeth pulled the big cooking pot from the fireplace. "Just park yourself over here while I serve the food, Dora." Eudora did so just as several kits started pouring in through the doorway. They stopped in surprise for a moment when they saw the strange cub, but then excitedly started crowding around hir, trying to get a better look. "Wow!" "What is she?" "What’s she doing here?" "Can we play with her?" The excitable kits were only about a third of Eudora’s size, and shi found them to be incredibly cute, not realising that some were actually older than hir. "Cublings! Behave! Dinner first, and then she can talk." Alisbeth herded the kits over to a low table where they were served bowls of food. She had to get Eudora to eat at the adults’ higher table though because she towered over the children’s table. Eudora ate ravenously, and gladly accepted an offer for seconds. While they ate, Shaman explained everything that she had learned about the strange child since she met Dora and while they walked to the village. After Eudora finished hir second helping, they started asking hir more questions. "Can you tell us where you come from?" Alisbeth asked. "Earth," Eudora answered, proud of knowing that. "Earth? You come from the ground?" the vixen replied. "No, from another place. We came in ships that flew up in the air to the stars. Then we waited a long time, then we came down here." Shaman’s eyes widened in disbelief. "No, it can’t be! Can it?" Alisbeth looked at Shaman questioningly. "Do you know what she’s talking about?" "I’m not certain, but I think that she’s talking about star ships that flew between worlds. I think that she has come to Tanador from a world called Earth." "Ships can’t fly up to the stars," Alisbeth said. "They once could," Shaman replied. "You’re too young to have ever seen anything like that though." Alisbeth snorted in amusement. She was hardly young, but she had to admit that Shaman was the oldest Garetta that she knew about. She went over to Eudora and cuddled the strange child. She couldn’t deny though that this strange child needed an equally strange origin. "Is Shaman right, Dora? Are you travellers in ships that sail the stars and you come from another world?" "Uh-huh," Eudora sleepily confirmed. The full stomach and hir tiredness were combining to make hir start to doze off. Alisbeth’s maternal instincts were fully engaged, and she let the cub snuggle up to her. Eudora practically fell asleep immediately. "I don’t think that we’re going to get any more answers from her for a while. A full tummy and a warm place to sleep – that’s the best medicine." "For the moment," agreed Shaman. "However, we need to find her parents. I’ll have a talk with the hunters and see if they have noticed anything unusual lately. "For the child’s sake, I hope that you find something soon. However, she will be fine in my care for the time being." "Thank you, Alisbeth, and thanks for the fine meal also. I’ll be back tomorrow with any news." She then left to seek out the clan’s hunters before heading for her rendezvous with the village chieftain. She was not going to have any luck tonight though. When Goldfur and Garrek had accepted this assignment, it was with great anticipation and excitement. The automated survey drones had reported a habitable planet, a rare find, but one with a difference. This planet had a derelict colony ship orbiting it. The drone hadn’t been set up to investigate spaceships though, so the data on it was minimal. An exhaustive search of the old records had finally turned up some information though. Before the formation of the Star Corps, colonisation expeditions were rather haphazard and organised by special interest groups that didn’t share their data with others. This ship was listed as the Greta Lynn, and they had named their destination as Tanador. They had left Earth with livestock and the majority of their colonists in cold sleep because the ships of that period were very slow, and the resources had needed to be conserved. The ship was never heard from again until the drone discovered it. The drone could not detect any evidence of high technology on the planet, so either they had regressed, failed, or encountered hostile native life. A combined Star Fleet and Star Corps expedition was organised – Fleet to deal with a possible First Contact situation or hostile forces, Corps to deal with the lost colony and possible exploration. Goldfur had been to many new worlds, some teeming with life, others barely tolerable even with sophisticated equipment. This world though might be the first time that shi could meet a new intelligent species, and that prospect excited hir. Two star ships were despatched – the FSS Firedrake was the Star Fleet ship, and the Charles Darwin was the Corps ship. While the Firedrake investigated the derelict colony ship and scanned the world for traces of technology from orbit, the Corps personnel set about putting expedition camps in areas that they were certain were uninhabited. Goldfur could hardly wait to get on the surface. Shi could have left the cubs up on the ship, but shi preferred having them close by hir, and for them to experience a new world. Now shi was greatly regretting that decision. A search had been quickly organised, and teams soon spread out in all directions. Nature sent them a cruel blow though, sending a brief but intense local shower that obliterated tracks and diluted scent markers. After a fruitless search for the errant cub, the teams were being recalled due to the failing light. However, the search continued, but with the full weight of Federation technology behind it. Every survey scout was brought back from planetary scanning tasks and they and the mother ships concentrated their attention on the area surrounding Goldfur’s base camp. If Eudora had been wearing even the smallest piece of Federation technology, they would have detected it. Unfortunately shi had left the shuttle without hir combadge that hir mother insisted that shi wear at all times. All shi had on was some clothing that was undetectable, and although the scanners picked up a plethora of life-forms, there was no way of telling a chakat apart from all the other creatures. However, all that scanning didn’t go completely unnoticed. In the hut of the Comm-Sa chieftain, a long-dormant piece of technology was awakened. An indicator lit up and an electronic chirp was emitted. The reaction to that event was way out of proportion to its size. When Shaman walked up to the chieftain’s hut, she was surprised to find that it was buzzing with activity, and more people were arriving all the time. "What’s going on?" she asked one of the tods standing by the door, stopping most of the Garetta from coming in. "One of the ancient relics has been activated, and Chief Freqmod has called for a meeting with the elders. I’m afraid that you can’t come in right now, Shaman." "I see. Did you hear about the strange cub that I arrived with this afternoon?" "I did hear something. Tansit told me that he’d seen you with a huge cub that was not a Garetta, but you had rushed it to the den of Alisbeth without answering any questions." "That’s correct," Shaman confirmed. "She was lost, but she’s now resting with Alisbeth. Now, you have a very strange child that has never been seen by anyone, and at the same time an artefact has been activated. Don’t you think that there might be a connection?" The tod frowned. "You’re right. The chief should know about this." Shaman smiled tightly. "Yes, I would think so. Will you please let me in to discuss this with Chief Freqmod?" "I don’t know. The chief specifically told me that he didn’t want the council to be disturbed." "Oh, for Cirkut’s sake!" exclaimed a female voice, "Don’t be so pig-headed, Anoti. Let Shaman in. I’ll take her to see Father." Anoti winced, then sighed. "Okay, Elektra. On your responsibility then." "Of course," Elektra replied. The very gravid vixen waved Shaman inside. "Thank you, Elektra," Shaman said. "For a while there, I thought I’d have to take my news to the Tekku or someone who would listen." Elektra shook her head. "Anoti always has a stick up his tail hole, but it does make him pretty good at his job. I must admit that I am curious about this big cub that you found, even if it isn’t related to the artefact." "She found me, actually, and I think that this sounds like too much of a coincidence for it not to be related." "I think so too. Just wait a moment while I get Father’s attention." Elektra opened one of the inner doors and entered the room beyond. Before the door closed, Shaman glimpsed several elders gathered in a discussion group, an object set on the floor in their midst. After half a minute, Elektra returned and waved Shaman inside. "Welcome, Shaman," Chief Freqmod said. You have arrived a little earlier than expected, and bringing us a peculiar visitor, I’m told." "That I have, Chief Freqmod, and I believe that you and the elders are going to find her to be a very important visitor indeed." Shaman was given the full attention of those gathered there, and she told them all that she had learned, and her speculations. The level of excitement doubled. At last it seemed that the Creators had arrived to bring their blessings on the Garetta, and the Comm-Sa would be their heralds! Meanwhile, one of the objects of their excitement woke up from hir nap, much to the delight of the Garetta cubs. They all wanted to indulge their curiosity about the cub, and Eudora was just as curious about them. Soon that curiosity had turned into rather boisterous play, with all the kits swarming over the much larger cub. "Cublings, play nice with your new sister…er… brother," Alisbeth said, hesitating as she saw something that she hadn’t noticed before. She looked at the chakat even more closely and grew confused. Was this child male or female? Could he or she be both? That seemed extremely odd to her. But then again, this was a totally different species, and Shaman had said that she/he had come from the stars. Was this normal for them? Aside from size, the cub behaved just like any other child. Her children didn’t seem to have any concerns though, and they were all enjoying themselves, so she would just have to wait a while before finding out more. Despite their wet weather gear, Goldfur and Garrek were feeling rather miserable in the persistent rain, but Goldfur had insisted on staying out on foot to try to pick up any trace of their daughter even while the sophisticated electronic search was being undertaken. "Goldie," Garrek said, "Surely if Eudora is out in this unpleasant weather and feeling panicky, you could sense hir?" Goldfur stopped and ‘listened’ empathically for the hundredth time, and shi frowned in puzzlement. "I would agree, except the only thing that I can sense is… excitement? Enjoyment? I can’t understand it." "Perhaps shi’s found safety?" suggested Garrek. "If shi had just found shelter, then shi wouldn’t feel this way. Shi would have to be safe in the company of others," concluded Goldfur. Shi looked at hir lifemate in realisation. "Garrek, shi must have found the local inhabitants! If one of our people had found hir, they’d have informed us by now, so it must be some other person or persons shi’s with. Come on, let’s get back to the ship. We’re wasting time out here." "What are you going to do?" asked Garrek as he pulled out his comm to request a beam-up. "Simple – if shi’s with a group, they’re likely to have fires for cooking and warmth. We’re going to do a quick thermal survey. In this weather, those heat sources are going to stick out like beacons!" "Of course," agreed Garrek. "I bet that we find hir quickly now, Love. Just wait and see." Their excitement was a little dampened though when they talked to the search coordinator. "Yes, we’ve already detected several scattered heat sources that match primitive tribal settlements. Two are within range of a wandering cub. However we still have to deal with a possible First Contact scenario, and we can’t just walk in and say, ‘Hi! Have you got a lost child of ours?’"
"Oh yeah?" Goldfur said in a dangerous tone of voice. Commander Sable frowned. "Technician Goldfur, you have my greatest sympathy and support, but you will not compromise our mission by precipitous action. Barging into this situation may actually do more harm than good, and besides, didn’t you just tell me that you sensed that Eudora is currently happy?" Goldfur nodded, forced to concede the point, but still not happy about it. Sable continued, "We will have teams at both sites soon to observe and advise the best course of action. We will keep you up to date, but I recommend that you get some sleep now so that you can be at your best in the morning." "I want to be on the First Contact team," Goldfur demanded. Sable refused to be swayed. "If the circumstances permit, I might let you go with the team, but I won’t guarantee that." Goldfur realised that Sable had conceded as much as he was going to do, so shi said, "Very well. Goodnight Commander." "Goodnight Goldfur. Rest well and keep up the optimism. We’ll get hir back soon; I know it." It took several hours to get teams into place at each site without disturbing the local inhabitants. What they found in each case was a fairly sophisticated, although technologically primitive, village surrounded by a barricade, presumably to keep out hostile wildlife, much like similar fortified villages had done back on Earth. They approached from downwind from where their flitter had dropped them off, just in case the locals had a good sense of smell. Beaming down was not an option because they could not choose their cover properly from a distance, and the shimmering light effects would have stood out far too well in the darkness. Despite their cautious approach, they were in place well before sunrise. Unfortunately the prevailing wind meant that they had to take a position that was far from the main gate. It lent support to the scent theory though because any sentries would be able to smell a potential danger long before they could see it. However, it meant that they could barely see anyone at that gate. Eventually though, as the pre-dawn light heralded a new day, one of the observers at the Comm-Sa village quietly announced a visual. "I can see someone opening the gate," she told her team-mates. "It’s… a taurform. Looks a lot like a foxtaur, but very small. I don’t think it’s a child… wait! Two more have just emerged, and they’re carrying hunting weapons. Looks like a tod and a vixen, I think." By then her team-mates had gotten their scopes on the pair also. They had taken off at a quick trot at nearly a right angle to the gate, so the watchers got a good side view of them before they disappeared into the scrub. The team’s datacorders had plenty of time to get a good scan of the foxtaurs though, and they pored over the results. 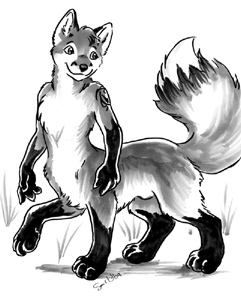 "Preliminary scans support the idea that they are Terran foxtaurs, although of a previously unknown breed. That’s a good indication that they’re part of the colonisation effort, and not an alien species that would require a rigorous First Contact procedure." "I’ll bet Goldfur will be happy to hear that," another added. "They’ll just have to put together some sort of diplomatic team, perhaps all taurs just to make them feel more familiar." "And you’re basing all this on seeing just two hunters?" the team leader asked dryly. "Stop speculating and keep watching. When we’ve got more information, we’ll pass it on to the decision-makers." The trio fell silent again, and they observed for a long time as more of the inhabitants emerged, some to tend fields, some more hunters, and some that looked like they could be traders. They were soon all convinced that the foxtaurs were the only species represented there, unlike the mixed morph populations of other colony planets. They reported the news to Commander Sable and learned that the team that was investigating the other potential refuge of the lost cub had found much the same thing. It was a pity that their awkward positioning prevented them from seeing everyone who exited the gate. Activity started early in the typical Garetta den. Alisbeth had several cublings to get breakfast for, not to mention their unusual guest, so she was up bright and early at first light. As the children woke, she doled out bowls full of nutritious food that would keep the hyperactive youngsters fuelled up for the day. Then they played with each other until the Nightwatch declared that the area was safe, and then she shooed them out to play in the fields under the supervision of the cub-minders. Alisbeth noticed that her eldest kit and Dora seemed to be getting along especially well, so she said to him, "Krisofer, I want you to look out for Dora. She’s new here and does not know the land like we do, and I want her to be happy and safe if… when… her parents come looking for her." "OK, Mom," Krisofer replied. "I’ll show her the relic pile. That’ll be fun." "That’s fine. Just be careful when you’re climbing over it." "Aw, Mom! You tell me that every time. You know I’m careful." Alisbeth gave the squirming cub a hug. "I know, but I worry anyway." "Come on, Dora!" Krisofer said as he escaped from his mother’s clutches. Eudora giggled and followed Krisofer. Shi noticed a lot of the Garetta staring at hir, but shi felt only curiosity and no hostility, so it didn’t bother hir. Several other cublings followed them, plus a couple of adults who seemed to be keeping an eye on them all. Shi nudged Krisofer and asked as shi pointed at the nearest one, "Who’s he?" Krisofer glanced at the adult. "That’s Digi. He’s one of the clan’s minders. He’ll be watching out for us outside." "Why?" Eudora asked curiously. Shi hadn’t run into anything really bad on hir walk. Krisofer was surprised that she needed to ask. "Because there are things that might attack us. That’s why the adults usually work in pairs to keep a lookout for each other." "I got bitten by a beetle yesterday," Eudora told him. "I mean lots bigger things. Things that want to eat us." It hadn’t occurred to Eudora during hir little adventure that there might be danger like that. Shi was too used to the more civilised worlds. Krisofer took hir to explore the relic pile. Machinery large and small was scattered around a field, some of it in large heaps. Some had their guts stripped out while others were salvaged for their metal and other valuable materials. Krisofer explained that according to Garetta lore, they had been the tools of the Creators which they had left for their children to use, and one day they would return with more and better gifts. Krisofer really didn’t care much – he just thought that it was an interesting and exciting place to play. Apparently many other cublings thought so too as there was quite a crowd of them there. They hadn’t been exploring for very long though when an high-pitched squeal of terror pierced the air. Eudora sensed a stab of fear that made hir tremble, but then shi bounded in the direction of the cry. Shi skidded to a stop along with a group of the cublings and shi gasped in horror. There were… things swarming out of the wreckage. They looked a bit like insects, but they were huge and ugly, some of them half as big as some of the younger cublings, and one of them was trapped within a ring of the horrors. "Everybody back to the village as fast as you can!" bellowed Digi who then started to look for a way to get to the frightened cub. Krisofer tugged at Eudora’s arm and said, "Come on, Dora! They’re venomous. You can die from their bite." "But what about him?" Eudora asked, pointing at the terrified cub who was desperately trying to find an escape route. "Digi will get him," Krisofer replied without conviction. Eudora picked up a piece of rusty pipe that was lying on the ground and suddenly took off. Chakats have one ability in common with their feline ancestors – they could leap enormous distances, even from a standing start. Eudora was younger and smaller, but hir running start enabled hir to clear the ring of nightstalkers. Shi skidded to a stop next to the cub and whacked the nearest creature with the pipe. It crunched and leaked a nauseous green ichor. "Dora!" Krisofer yelled in panic. "Mom’s gonna kill me if you get hurt!" Eudora was too preoccupied with the advancing swarm of nightstalkers to take notice. Shi grabbed the cub and tucked him under one arm, and then lashed about vigorously with the pipe. Eudora looked around to see two of the creatures about to jump on hir back from atop some of the junk. Shi quickly swung hir tail, hitting them both in mid-jump, knocking them into the others. That only bought hir a few seconds though, and shi realised that shi was trapped now because shi didn’t have the room to do a run-up. Shi looked about for an answer. Digi realised that the strange cub was in trouble, but if shi could do another of those amazing leaps, he thought that he had the answer. "Dora!" he called out the name that Krisofer had used. When he was sure that she had noticed him, he pointed to a beam projecting from the wreckage to one side of her. "Can you jump up to that beam and bounce over to that pile over there?" Eudora looked at the beam. It was pretty high, but shi thought shi could do it. Shi had to! Gathering hirself into a crouch, shi jumped as hard as shi possibly could... and just made it. Shi absorbed the impact of hir landing and sprang back out again, flying over the nightstalkers which hissed in anger. Shi hit the ground running, desperately wanting to get far away from the horrible creatures. Shi almost bowled Digi over, who then relieved hir of the rescued cub. "Well done, Dora! Now let’s get you well away from here while the others deal with the infestation." Eudora only then noticed a group of adult Garetta approaching from the village, each carrying what appeared to be heavy backpacks. The packs had hoses coming out of them, and as soon as they were close enough, the Garetta started spraying some sort of liquid onto the nightstalkers. That didn’t seem to affect them much until one Garetta yelled, "Clear! ", then threw a burning torch onto them. They burst into flame, and a terrible hissing squeal was heard as they died. More groups of the nightstalkers were sprayed until all had been dealt with, then the extermination party started seeking out possible nests to spray those too. By that time, Eudora was being led inside the village gates, with many of the Comm-Sa clan praising hir courage and patting hir back or tousling hir hair. The cub’s mother gave hir a huge hug of gratitude as tears of relief flowed over her cheek fur. It made Eudora wonder again where hir mother was and when shi would come to find hir. While the observers had missed the exit of Eudora and the cublings, the shifting wind had forced them to relocate, but they ended up with a better view of the gate. They could hardly miss then the crowd of excited Garetta, although because the relic heap was on the side away from them, they did not know the cause of the excitement. They could see the focus of attention though. "I have a contact! I can see Eudora!" one announced in an excited but low voice. "Let me see," said the team leader. Moments later, he said, "Confirmed." He tapped his comm. "Observation Post 2 to Commander Sable." "Sable here," came back the commander’s voice promptly. "We have a confirmed sighting of Eudora, sir. Shi seems to be safe and well in the company of those foxtaurs." "Excellent news! Stand by, Post 2. We will have a contact team out there as soon as possible. Sable out." Eudora was ushered into the big hut near the centre of the village. Inside waiting for hir were several elderly Garetta, including Shaman, and one of them had various odd equipment adorning him in a ceremonious manner. He looked at Eudora keenly, and shi suddenly felt nervous. Freqmod beckoned Eudora closer and then said, "So this is the strange cub who has been causing such a stir in our village." "Yes, sir," Eudora said in a small voice. "Sorry, sir." "Sorry?" Freqmod echoed. "What for? You were lost and we gave you sanctuary. In return you have saved the life of one of our cublings. You have nothing to be sorry for, young one." The chieftain felt a little strange calling someone almost as big as himself ‘young one’, but now that he could get a good look at her, it was obvious that she was only a child, albeit a very odd one. "Shaman tells me that you are a chakat, yes?" "How would you like to be an honorary Garetta, Dora?" Eudora wasn’t completely sure what that meant, but shi went along with him. "That’d be nice, sir." Freqmod smiled kindly. "Very good. Dora the Chakat, in recognition of your exceptional courage and remarkable deed, we welcome you into our clan." He placed two brightly coloured feathers into Eudora’s hair behind hir left ear, then painted the clan mark on hir forehead. Someone handed him a leather vest decorated in the clan colours which he put onto Eudora. "You are now Comm-Sa!" he declared. The people who had crowded into the room cheered. Eudora felt a little bewildered but pleased. Shi could sense the good will of the little foxtaurs, and shi liked them a lot. Someone suddenly hugged hir, and shi looked down to see Krisofer grinning back at hir. "Now you really are my big sister!" he declared. The adults laughed as Eudora easily lifted Krisofer and hugged him to hirself. When they were done, Freqmod said, "Now what can we do for our newest clan member?" Eudora grew serious again. "Please, sir, I just want to find my mommy and daddy." Freqmod had been expecting that answer. "Then that is exactly what we will do. Come with me now, Dora." Freqmod exited from the hut, followed by a group of people whom he had already selected for their expedition. There was a crowd outside waiting to see the strange cub that they had only heard about so far. A cheer went up when they saw hir wearing the clan colours. Eudora felt both excited and daunted by the response. Never had so many people focused their attention on hir. Shi waved to them as they made their way out of the village, with Shaman guiding the group in the direction of the place where shi had been found. Commander Sable considered himself fortunate that the exploration team had prepared well for a possible First Contact scenario. Because of that, he had a wide choice of personnel to choose from, including one taur – a Stellar Foxtaur – Mountain Breed to be precise. That was fortunate because although shi was much larger than the locals, at least shi resembled them a lot, which hopefully might make them feel more comfortable. Hir name was Dewleaf, and shi had been thoroughly trained in all the possible variations of First Contact that the experts could think of. One thing that they had not considered though was reining in an impatient and anxious chakat mother. Dewleaf had directed their flitter to land out of sight of the village. The team had then marched in the direction of the village, leaving the pilot on stand-by in case they needed him. They could also beam up, but that was the kind of thing that the Federation didn’t want to display in front of a primitive culture, so it was only used as a last resort. Their group consisted of Dewleaf as team leader, Goldfur and Garrek, a Caitian communications specialist named M’Láryo, and a Human security expert named Emile Kade. M’Láryo was needed if the little foxtaurs didn’t speak Terranglo, or the language had had been corrupted beyond comprehension, Kade was a one-man fighting force in case things went badly wrong, but while Dewleaf recognised Goldfur and Garrek’s professional competence, their skills weren’t needed on the team, and the Chakat was really beginning to irritate hir. However, Commander Sable had foisted them upon hir, and shi had to deal with it. "Shir Goldfur, will you please stay at the rear of the group!" Dewleaf said for the tenth time. Goldfur looked back in annoyance. "Eudora is close; I can feel hir!" "I know. Be patient; we’re almost there. We just…." Shi was interrupted by the chirp of hir comm. "Dewleaf here," shi acknowledged. "Observation Post 2 here," came the voice over the comm. "We have just seen a group of the foxtaurs leave the village with Eudora in their midst, and they headed on almost a collision course with you." "Thank you, Post 2. Dewleaf out." The forester linked hir PADD with the high-altitude recon-bot that had been moved into place. Shi immediately spotted the group that the observation post had reported, and noted its position relative to theirs. Shi saw a clearing that would serve as a meeting point and altered course slightly towards it. They reached it with some minutes to spare before the foxtaurs arrived. "Kade, set yourself up out of sight. I don’t want these foxtaurs to see any obvious weapons unless they are really needed. M’Láryo, stay with Kade for now. I’ll call you if I need you, but I want the locals to see nothing but taurs for their first encounter. A bit of familiarity will help ease concerns about meeting new species." The two nodded and departed. "Shir Goldfur, you and Garrek stay behind me. Remember that you’re twice their size, so that has to be intimidating. At least Garrek and I are foxtaurs too, but the only chakat that they’ve seen is Eudora and we can’t know how they will react to you, so keep your force-field belts on auto-response." Goldfur reluctantly obeyed, chafing at having to wait. Shi could smell Eudora’s scent now. Only the knowledge that shi apparently wasn’t distressed kept Goldfur from bolting to hir right away. The seconds crawled by. They heard voices well before the first of the Garetta rounded a bend in the path and jolted to a stop at the sight of the trio. This was apparently a hunter vixen because she was carrying various hunting weapons. It made sense to have a hunter in the vanguard of the party. The forest was likely to be quite dangerous even to the locals. The vixen eyed them carefully, then called back, "Chief Freqmod, I believe that we don’t need to travel any further." Dewleaf was greatly heartened. Not only was the language quite understandable despite a strong accent, but the vixen hadn’t aimed any of those weapons at them. A few more of the little foxtaurs soon appeared, one of them quite elderly. "What do you… oh, I see." The chieftain allowed his party to gather close, some climbing nimbly into the tree branches to get a better view of the three giants waiting for them in the clearing. Eudora had been kept nearer to the back of the group, surrounded by Garetta to protect hir if necessary. Shi was ushered forward, and in a moment shi spotted Goldfur. "MOMMY!" shi yelled in delight. "Eudora!" Goldfur completely forgot hir instructions to stay put, and shi dashed forward to embrace hir wayward child. The sight of a strange taur twice their height charging towards them was more than a little frightening to the Garetta, but fortunately Eudora also dashed forward to meet hir mother halfway, and the little foxtaurs relaxed again when they realised that nothing more was happening than an extremely excited reunion of mother and child. Dewleaf called out, "Goldfur! Stop!" but shi quickly realised the futility of the effort. Shi saw the looks of concern on the foxtaurs’ faces turn to mere curiosity, and shi relaxed a little. It seemed that despite protocol being shot to hell, things might yet work out well for this first meeting. "You might as well go join them now too, Garrek," Dewleaf said resignedly. "This couldn’t be any more of a shambles." "Thanks," Garrek said, and quickly joined his mate and cub. "Missed you, darling," he told his daughter. Eudora hugged him hard. "Me too, Daddy." When they finally could stop hugging each other, Goldfur had a good look at what Eudora was wearing. "So what are these feathers and the vest?" shi asked curiously. "They made me Comm-Sa ’cause I saved one of their cubs," Eudora replied. "You did? And they’re called Comm-Sa?" Goldfur asked as shi looked at the foxtaurs. Freqmod spoke up. "I am Freqmod, chieftain of the Comm-Sa tribe of the Garetta clans of Tanador. It is the duty and honour of our clan to be the intermediaries between the Garetta and all others. I bid you welcome to our lands." Dewleaf recognised hir cue, and shi replied, "I am Dewleaf, and I am the representative of a vast society of many species, and we come in peace. I thank you for your welcome, and it is our hope that we can learn more about each other and become friends and allies." Freqmod nodded and said, "It shall be so, for are we not all children of the Creators? We have long awaited their return. That time has come at long last, and now our patience will be rewarded. Take us to the Creators, Dewleaf, so that we may offer up our achievements to them and claim what we have earned." Dewleaf looked around and saw the expectant faces of the Garetta and sighed to hirself. Suddenly things had gotten complicated again. Tanador, the Garetta and Shaman in particular are the creations of Roy D. Pounds II. Various background and plot elements in the "Little Cub Lost" series of pictures done by Roy were used as the basis for this story. copyright © 2009 Bernard Doove.